January | 2015 | The British in Crete, 1896 to 1913. British sailors from H. M. S. Anson. The first British troops to land in Crete were Royal Marines landed from H. M. S. Revenge at 3.15 p.m. on 15th February 1897; followed shortly afterwards that afternoon by parties from H.M.S Barflour and H. M. S. Rodney. The duties of the sailors and marines centred on patrolling both Canea and the surrounding countryside in order to keep Cretan Christian and Cretan Muslims apart. The illustration above shows ‘Bluejackets’ from H. M. S. Anson and appeared in the Illustrated London News on 1 May 1897. 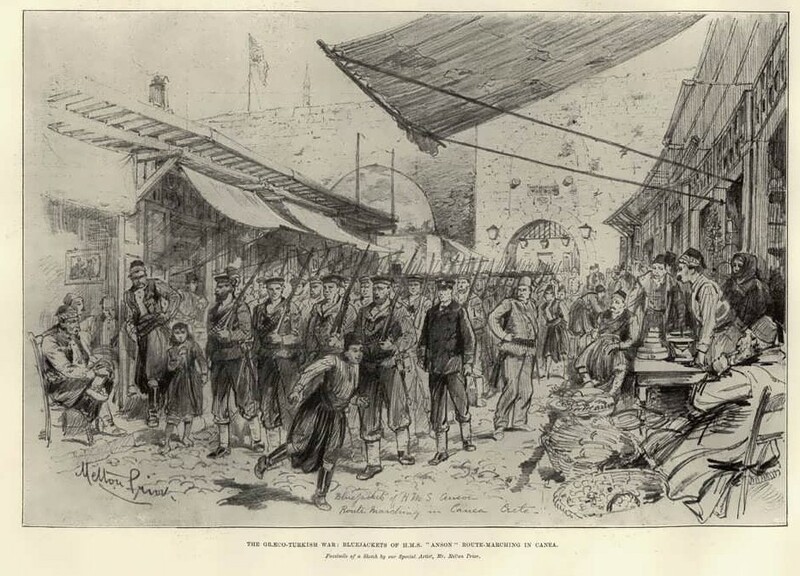 This entry was posted in European Intervention Crete, Naval, Royal Navy in Crete and tagged Bluejackets, British sailors, Crete 1897, European Intervention Crete, H.M.S. Anson on January 30, 2015 by Mick McT. I’ve used this illustration before. Then I discovered I wasn’t the only one interested in it. 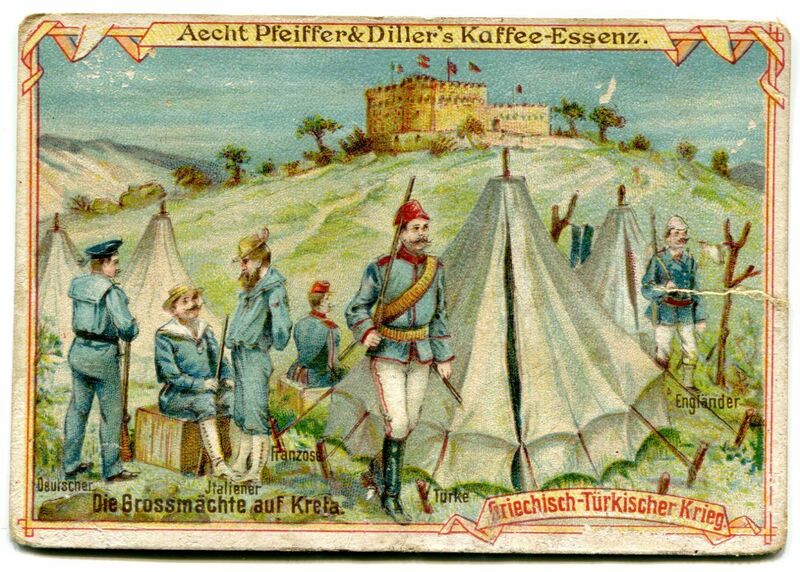 In spite of there being relatively few German troops on the island, and then only for a short time, one German Coffee company took advantage of their presence to produce an advertising card featuring them. 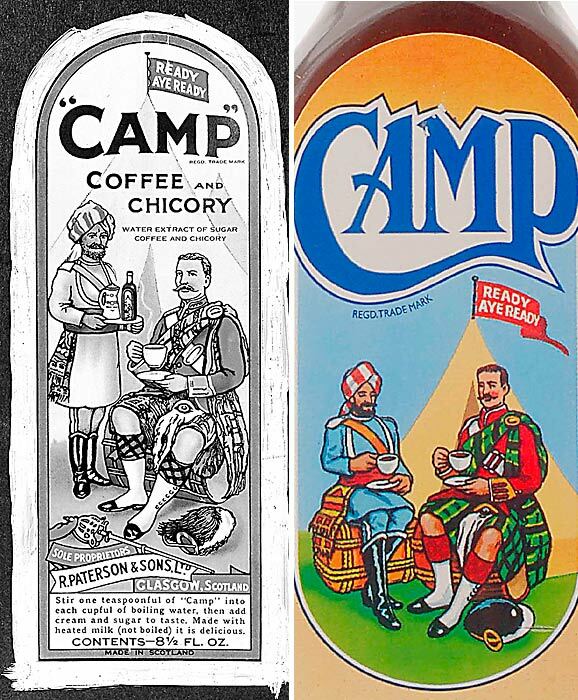 The practice of using pictures of troops in exotic foreign climes to advertise commercial goods, coffee in particular, was not unknown in Britain at the time. 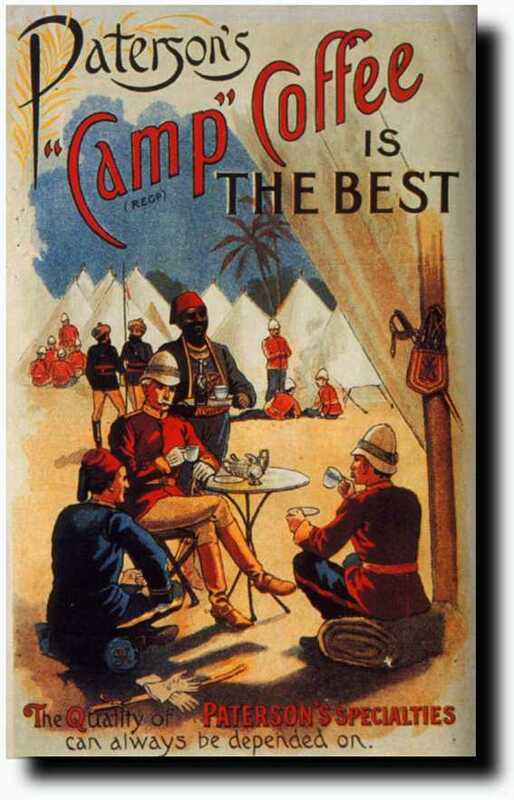 Camp Coffee Adverts. Colour version is currently in use. This entry was posted in European Intervention Crete on January 28, 2015 by Mick McT. 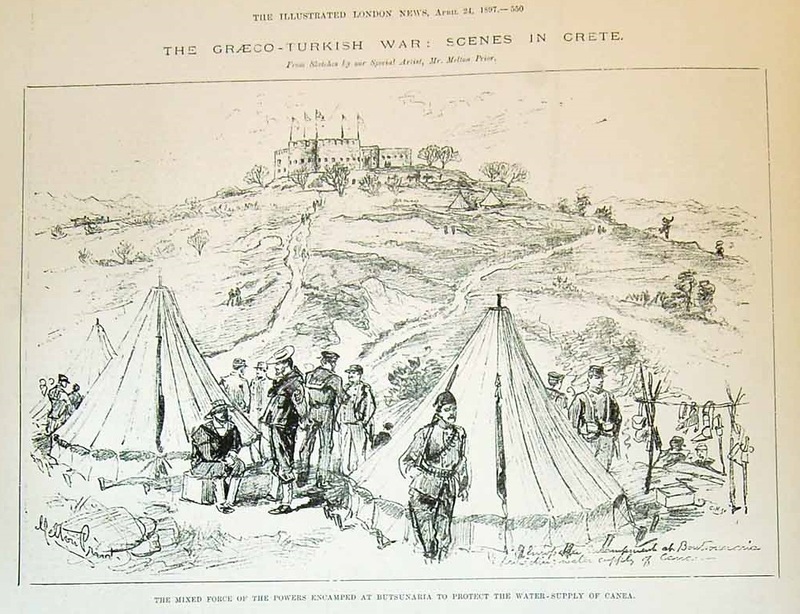 On arrival in Crete in March 1897, the ‘enemy’ the British troops faced were the invading Greek forces and Cretan Christian insurrectionists. The photograph above, ‘The Heads of the Insurrection’, appeared in the Supplement to ‘Black and White’ Magazine, 20 March 1897, and is attributed to R. G. Kruger. The text on the magazine page suggests the photograph was taken near Canea. Other than an apparent case of plagiarism, there are several things in particular to note about the photograph. Third from the left in the back row is a figure dressed in what appears to be a regular military uniform. This is possibly one of the Greek officers or artilleryman who are known to have traveled with a number of the insurgent bands. 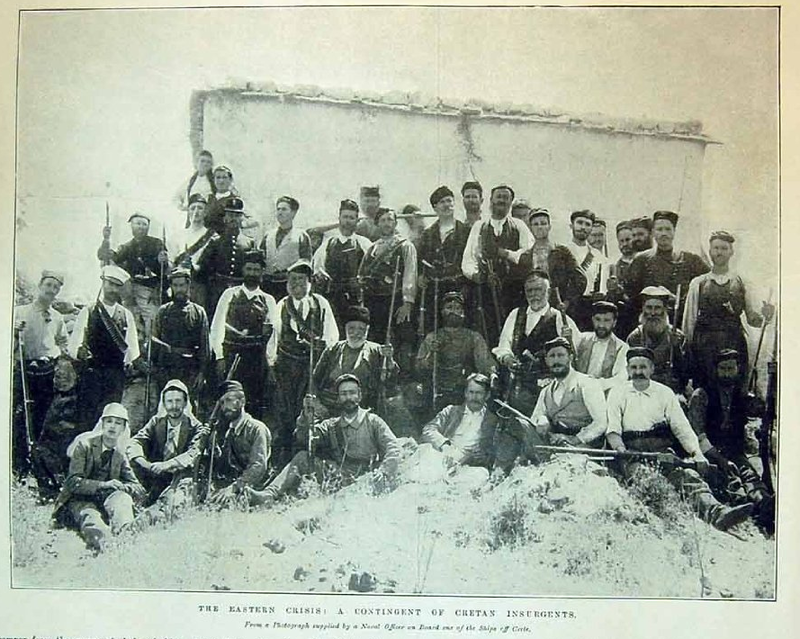 The second from right in the middle row with the white beard and black clothes, is the Cydonia chieftain Dimitris Gelasakis (1853-1912), uncle of my grandfather, and a close friend and associate of Eleftherios Venizelos! This entry was posted in Cretan Rebels, European Intervention Crete and tagged Cretan Christian Rebels, Cretan Christians, Crete 1897, European Intervention Crete on January 24, 2015 by Mick McT. The publication date is 20 March 1897 which means the British troops shown, top left hand corner, are Royal Marines since the British Army didn’t land until 24th March that year. The other troops are German, Russian, French, Italian and Austro-Hungarian, and the location is most probably Canea. 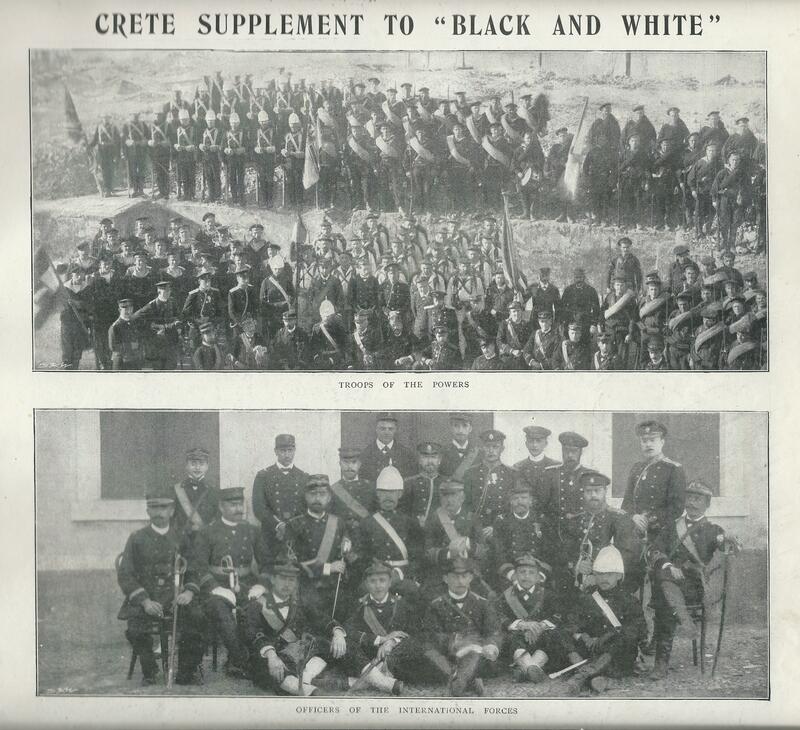 This entry was posted in European Intervention Crete, Royal Navy in Crete and tagged Crete 1897, European Intervention Crete, Royal Marines on January 14, 2015 by Mick McT.